Print one copy of the weight loss log every year. Record your weight on the weight loss tracking chart. At the end of every month, review all recorded weights and record your weight range for the entire month. Note the trends over time: month to month and year to year. 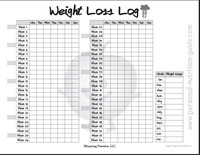 Make a special file labeled "weight" to keep track of your log for weight loss over time. As the year pass by, you'll be glad you did! **I recommend weighing no more than once a day. Weight fluctuations within the day are normal and reflective of variations in water weight, not body fat. (See body fat model here.) Weigh at the same time each day, preferably in the morning.